A couple whose 3-month-old daughter died in 2004 can sue the makers of a baby sling despite a statute of limitations and despite the Consumer Product Safety Commission (CPSC) finding that the death was a "freakish accident," a federal judge ruled, according to Courthouse News Service. Ann Heneghan placed her 3-month old daughter, Cathleen Delia Ross, in the Nojo Original Baby Sling for approximately 10 to 15 minutes while shopping in October 2004. When Heneghan tried to put Cathleen back in her car seat, she noticed the child was unresponsive and called paramedics. The child was resuscitated, but eventually found to be brain dead and taken off life support. Heneghan and her husband John Ross say they were originally told that Cathleen had died from Sudden Infant Death Syndrome (SIDS), and that the medical examiner never mentioned the Nojo sling as a possible cause of death. The death was reported to the CPSC, which investigated and called the infant's death a "terrible, freakish accident" involving SIDS and found the sling was not defective, even though the suit says an emergency room doctor called the case "asphyxia by snugli." But the commission was later to find that similar slings had been implicated in multiple infant deaths and in March 2010, warned that parents should exercise extreme caution when using the slings and said it had learned of at least 14 deaths associated with sling-type carriers in the last 20 years. A few days later, Infantino LLC recalled one million infant slings following reports of three infant deaths. That's when Heneghan and Ross say they first became aware that the Nojo sling might have played a role in Cathleen's death. 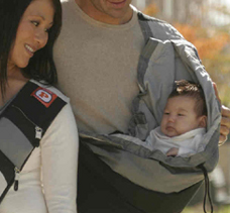 Though the recalled sling was a different brand, it was allegedly of the same type. The commission also emailed Heneghan with its new warning about the suffocation hazard posed by slings in the first few months of life. According to the suit, Heneghan then contacted the medical examiner who had conducted the original investigation and discovered for the first time that her daughter's death was the result of positional asphyxiation -- not Sudden Infant Death Syndrome as she had been told previously. The suit claims that the sling's manufacturer, Crown Crafts Infant Products, failed to warn consumers that the sling should not be used with infants under four months old because of asphyxiation dangers. Henegan later amended her suit to include Dr. William Sears. She says she bought the Nojo sling after reading about it in Sears' parenting guide, "The Baby Book." In a motion for summary judgment, Sears and Crown Crafts said a three-year statute of limitations bars the couple's suit. But U.S. District Judge Robert Bryan denied the motion. The case is set to go to trial on June 4.